The word may seem strange, or an overstatement. But how else could one characterize the total reversal of the meaning of an event as amazing as the July 5 referendum, only hours after its conclusion, by those that called for a “no” vote to begin with? How could one explain that New Democracy’s Vangelis Meimarakis and To Potami leader Stavros Theodorakis — heads of the camp so crushingly defeated on Sunday — should have become the official spokespersons for the line being followed by the Greek government? How is it possible for a devastating “no” to memorandum austerity policies to be interpreted as a green light for a new memorandum? And to put it in commonsense terms: if they were disposed to sign something even worse and even more binding than European Commission President Jean-Claude Juncker’s proposals, what was the point of the referendum and the struggle to achieve victory in it? The sense of the absurd is not just a product of this unexpected reversal. It stems above all from the fact that all of this is unfolding before our eyes as if nothing has happened, as if the referendum were something like a collective hallucination that suddenly ends, leaving us to continue freely what we were doing before. But because we have not all become lotus-eaters, let us at least give a brief résumé of what has taken place over the past few days. Last Sunday, the Greek people staggered Europe and the world, responding en masse to the government’s call and, in conditions unprecedented by the postwar standards of any European country, overwhelmingly voted “no” to the extortionate and humiliating proposals of the lenders. Both the extent of the “no” vote and its qualitative composition, with its enormous lead among workers and youth, testify to the depth of the transformations that have been occurring, or rather that have crystallized in such a short time, in Greek society. Friday’s mass mobilizations, the climate “from below” that has prevailed over the last week, not to mention the enthusiastic wave of international solidarity, testify to the huge potential that is opened by the choice of popular political conflict rather than retreat. But from Monday morning, before the victory cries in the country’s public squares had even fully died away, the theater of the absurd began. Under the aegis of the actively pro-Yes Greek president of the republic, Prokopis Pavlopoulos, the government summon the heads of the defeated parties to elaborate a framework for negotiation positing the euro as an unpassable outer limit of the Greek position and declaring specifically that it has no mandate to leave the monetary union. The public, still in the joyful haze of Sunday, watches as the representative of the 62 percent subordinated to the 38 percent in the immediate aftermath of a resounding victory for democracy and popular sovereignty. On Tuesday, the government, with no new “proposal” to make, transfers its operations to Brussels for the extraordinary Eurogroup meeting and, as is absolutely logical, finds itself confronted with a new and even harsher ultimatum. The next day Euclid Tsakalotos inaugurates his duties as finance minister (in the interests of brevity we pass over the factor of Yanis Varoufakis’ resignation, simply noting that it was a demand of the lenders) by sending to the European Stability Mechanism (ESM), the organization that manages the greater part of the Greek debt, a letter requesting a new loan of €50 billion, which will be accompanied of course by a third memorandum. It is envisaged, indeed, that the parliament will begin on Monday to vote on the relevant enabling legislation. The Tsakalotos letter continues with references to Greece undertaking “to honor its financial obligations to all of its creditors in a full and timely manner.” It is obvious that despite the assurances that were heard after the proclamation of the referendum for “restarting discussions from scratch” the “negotiations” are continuing exactly from where they left off, with the Greeks lowering the bar for their opponents every step of the way. This amounts to more or less open acknowledgement that the result of the referendum was being interpreted with a specific end in mind, that of negotiation at all costs and avoidance of a rift. In these proposals we have evidently undertaken a powerful commitment to achieve the fiscal goals that are required on the basis of the rules, because we recognize, and respect, the fact that the eurozone has rules. But we reserve the right of choice, the right of being able, as a sovereign government, to choose where we shall place, and add to, the burden of taxation, so as to be in a position to attain the required fiscal objectives. 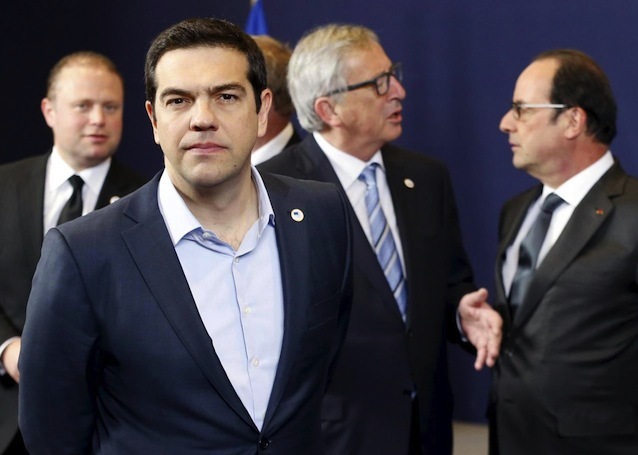 As was predictable, and probably even planned, this proposed agreement has triggered an uproar inside Syriza. For the moment, most of the strong reactions are come from the Left Platform and other currents of Syriza’s left wing such as KOE, the Maoist organization that has four MPs. In today’s dramatic meeting of Syriza’s parliamentary group, Lafazanis, minister of energy and leader of the Left Platform, said the agreement is “incompatible with Syriza’s program” and “doesn’t offer a positive perspective to the country.” The Left Platform ministers are expected to resign today.